Salmon is a family of migratory fish species found along the North Atlantic coast, the Pacific coast and in the Great Lakes. They are born in freshwater and can only spawn in freshwater, but between spawning seasons, those with access to oceans will migrate there. Although the exact methods and gear most effective for salmon fishing largely depends on the region, season and species in question, some lure types are believed to be most effective for salmon fishing. According to "Fishing Tips for Freshwater" by Gene Kugach, spoon lures are among the most effective for catching salmon species such as chinook and coho. Spoon lures consist of a concave, oblong oval attached to a hook. The oblong "spoon" is usually made of reflective or painted metal, and its design is intended to both resemble a small fish and mimic its random, fluttering movements as it is drawn through the water with a fishing reel, according to "Classic Fishing Lures and Tackle" by Eric L. Sorenson, Howard Lambert and Ron Schara. "The Complete Guide to Freshwater Fishing" states that spoons are especially effective for trolling and downrigger fishing, and notes that the best spoons are those that provide the most active fluttering movement. To exaggerate the fluttering potential of any spoon, the authors suggest you can gently bend a spoon using just your fingers to increase the concave angle. Another strong salmon fishing lure type identified by Kugach is the spinner, also called spinnerbait. The spinner category includes several fundamentally different designs, but the one feature they all share is one or more reflective metal blades that spin around freely as the lure is reeled in. The appearance and motion is designed to resemble the smallest fish. According to "Ken Schultz's Essentials of Fishing: The Only Guide You Need to Catch Freshwater and Saltwater Fish," spinners also create powerful vibrations in the water as they move, which helps to alert salmon to their presence in murky waters. Plugs, particularly the wobbling variety, are also effective for salmon fishing, according to Kugach. Plugs are solid, rigid lures that typically feature multiple hooks and are decorated with reflective paint to resemble fish. Wobbling plugs consist of two separate pieces connected by a hinge, which allows them to flutter back and forth as they're reeled in, attracting attention and creating vibration. Schultz identifies another niche plug type called a cut-plug lure, which is used almost exclusively for salmon fishing in the Great Lakes and Pacific coast waters. This style is a floating plug that is typically used in downrigger fishing. No matter what type of lure you select, color is a key consideration, according to Tom Nelson's Salmon University. 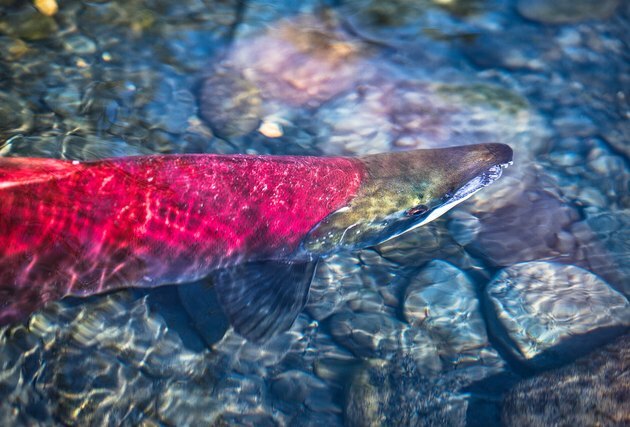 At depths of up to 50 feet, all colors are generally visible and acceptable for salmon fishing, but in deeper waters, stick to greens, blues and purples. Ultra violet and glow lures also work well in deeper waters. Some specific exceptions include using white lures when fishing for mature king salmon, and using red, orange and yellow lures in shallow water when fishing in Puget Sound or for sockeye or humpy salmon.